One of the standards for mathematical practice in the Common Core is to "construct viable arguments and critique the reasoning of others.” That’s a tall order for students used to sitting quietly in a math classroom passively receiving instruction. Knowing that improving the quality of math discussion in their classrooms won’t be easy, educators are applying the "lesson study" technique to improve their craft. During a "research lesson," only one teacher will deliver instruction, but other teachers in the lesson study group will be present to observe how students react, what sorts of solutions they come up with, and how they interact with one another. This is very different from many classroom observations that focus primarily on how the teacher delivers the lesson. During the planning phase, the lesson study group is thinking about all the small steps that might enable them to teach a little differently. For example, when it comes to discussing math arguments and critiquing one another, teachers know kids are often afraid to put their ideas forward. So one way to structure the lesson could be to ask students to put their solutions on a whiteboard. That makes their thinking visible, but they may feel less vulnerable. And there are bound to be differences in problem solving when all those ideas are out there, a good jumping-off point to critique one another’s thinking. As the group of lesson study teachers are thinking through the research lesson, they’re asking themselves: Will the lesson they’ve designed together elicit the kinds of errors they hope to see? Will it make students curious? In what order should the ideas be presented? How are they going to make sure the student ideas are visible to everyone in the class? It sounds like minutia, but these details could be the difference between the lesson going well or poorly. These teachers are trying to look into the future and predict how the lesson will go. To help them take accurate, helpful notes that can be discussed later, teachers are using an app called Lesson Note, developed by the Lesson Study Alliance in Chicago. Proponents of lesson study have found that many teachers new to the method don’t know what to look for when observing a classroom and they tend to sit in the back and focus on the teacher. The iPad app presents an observer with a seating chart of the classroom, with the option to add names of students. 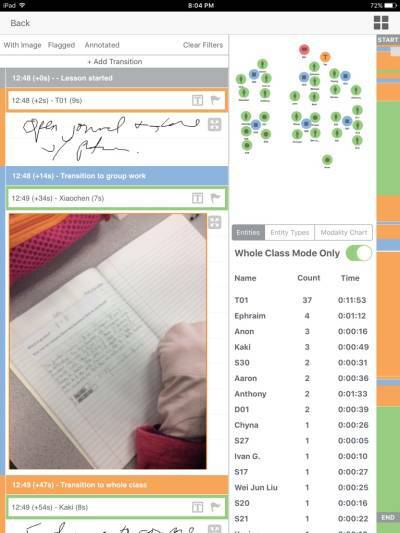 Sitting at the sides of the rooms, or intermingled with the students themselves, observers can use the app to select a student when he or she says something in class, and write a note. The same can be done when the teacher speaks, and a timer immediately starts when a note is opened to help give an overall sense of how much class time is spent on the teacher talking and how much spent on students talking. The notes are also time-stamped, “so you could actually say at such and such a time this student was still confused,” McDougal explained. The app also allows observers to note when a state change happens in class. They can choose between whole class, individual time, group work or other. “You can look at the distribution both in terms of how much time is whole class versus individual versus group, and when that time is occurring,” McDougal said. In more traditional instruction, the teacher often lectures for the first half of class and then lets students work in groups or individually for the second half. A different model would be a quick five-minute introduction to the task, 10 minutes of group work and then a whole class discussion about the work. “At the end of it you can see a timeline of what the lesson looked like in terms of how the lesson was distributed,” McDougal said. Many educators are recognizing that the best learning happens when students themselves are grappling with problems, and are seeking ways to shift class time toward that type of inquiry. The Lesson Note app helps make class time distribution very obvious. Additionally, observers can take photos of student work and upload them to a note. For example, an observer might snap a photo of wrong work, or an interesting way of approaching the work, before it is erased to show where a student was at that moment in class. Or, observers might take notes about how student A helped student B with a specific concept. The notes are more useful after the lesson if they are very specific. “We think that it helps promote better post-lesson discussions. That’s certainly our goal,” McDougal said. When he observes a lesson he’ll often take 90-100 notes, flagging the most important ones along the way. After the lesson, all the observers and the teacher get together to look through the student data they collected and analyze how well the lesson went. They think about what could be done differently in a future lesson to better meet the specific goal they are working on, like improving the quality of discussion that kids are having. 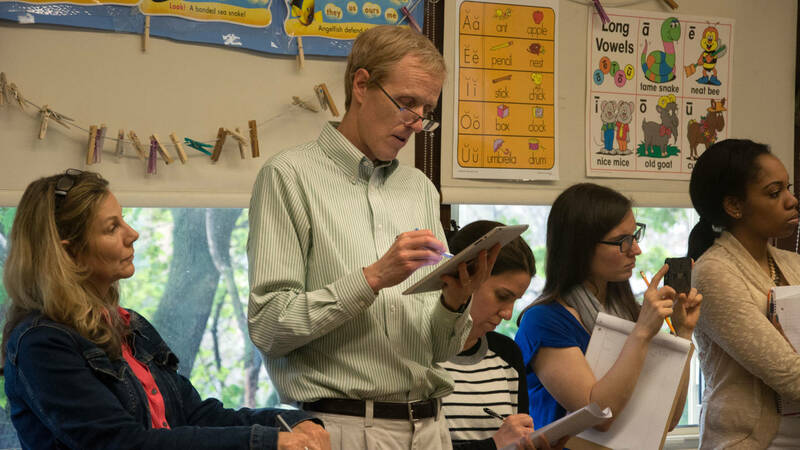 In a school dedicated to lesson study, teachers from other classes might also observe. While teachers at a grade level might be involved in workshopping a lesson in this intensive way only twice a year, they would observe other grade levels working on the same mathematical practice at various points throughout the year. In this way, the whole school moves toward improving instruction on one thorny problem. The Lesson Study Alliance developed this app as a tool to improve the quality of observations and discussions they are having with a group of Chicago schools engaged in this practice regularly. In an effort to boil down the essential components of the process, McDougal and Dr. Akihiko Takahashi have developed the Collaborative Lesson Research (CLR) which explores how lesson study could be implemented in an American context. Other educators have tried to use lesson study, but have implemented it unevenly to varied results. CLR is an attempt to map out the most important elements that should be part of any program like this. McDougal said he feels the Lesson Note app meets his nonprofit’s mission to improve teaching. That’s why the base level app is available for free. But at the request of administrators around the country, McDougal asked the developers to add a Web-based product that costs $150 per license and allows observers to upload the data to a server or the cloud, aggregate it in one place and make printouts. The app is not available for Android devices because the nonprofit did not have the funds. If a teacher were using this Web-based feature, he or she could also look back at all the data taken throughout the year and search for one student’s name. Then all the notes over time would pop up, helping provide a sense of that student’s development. Lesson study is a specific way of collaboratively working to improve teaching practice and is not meant to evaluate teachers. But even districts that aren’t explicitly engaged in lesson study are finding the Lesson Note app useful for their work. Coaches for a consortium of schools in Humboldt County, California, are using Lesson Note to deepen the feedback they give to teachers. Several schools in the area are part of a partnership to integrate STEM into the curriculum. They received a grant to develop teaching materials, receive extra training and release time to collaborate with colleagues. These districts have opted to do most of their professional development through coaching. “When the teacher invites the coach in, the idea is this is a new STEM-integrated lesson and they want to get feedback from the coach,” said Michael Kauffmann, director of Project HISI and a math and science intervention specialist. He and other coaches are using Lesson Note to facilitate their observations and make it easier to show the teacher his or her patterns in a post-lesson discussion. “You can map out during the class period how much time was spent on lecture, how much time was spent on student-to-student interaction, which in many ways is the direction Common Core is going,” Kauffmann said. He likes having the interaction data in front of him when he’s conferencing with a teacher post-lesson because often the teacher won’t realize how long he or she spent lecturing. And, Kauffmann has even helped design and teach follow-up lessons based on the misconceptions he documented with the app while walking around the classroom. In Chicago, a few teachers are even using the app as part of daily data collection. Third-grade teacher Gustavo Soto wrote in an email: “As groups are working I go around and take notes on the app which I can later use for assessing student work and student engagement.” Soto’s school, Daniel Boone Elementary School, is part of the Lesson Note Alliance, and Soto says he mostly uses the app when he’s participating in research lessons as an observer. “When I learned about lesson study I was like, oh, this is so much better than what I’ve been doing,” McDougal said. He was a longtime high school math teacher and then a K-8 math coach, but now he’s devoted himself to lesson study. He remembers going to traditional professional development sessions where ideas were presented, and he was expected to go back to his classroom and immediately implement them. Lesson study, on the other hand, feels hopeful and doable to him. He believes this model could change teaching for the better -- much like Japan has done since the 1960s -- but only if U.S. schools are willing to drop the traditional professional development model and try something new. “It gives you a chance to really think through all the details and address all the problems you are trying to address,” McDougal said. “And you do it with the moral and intellectual support of your colleagues and it’s not evaluative.” The focus is on designing better lessons, which changes the whole dynamic of the endeavor and makes teachers much more open to the experience. McDougal said very few people in the US are trained in this method, which is a large barrier to the method spreading. Only four to five schools in Chicago participate, and everyone benefits from the experience of Takahashi, a DePaul University math education professor and an expert on the technique. In a formal research lesson, a “knowledgeable other” helps the group navigate the process. McDougal says the number of people who could act as “knowledgeable others” is small. “There’s really only a handful of people in the US who know lesson study and know content and know teaching, and are really good at analyzing the lesson and giving remarks at the end of the lesson,” McDougal said. But a transformation is not impossible. In the 1960s, Japanese elementary education was very teacher-centered and rote. But over the past few decades the system has changed completely through lesson study, which ironically was imported from the US Now, all aspects of Japanese elementary school teaching (even PE and lunchtime monitors) use this method to continually improve their practice. The Japanese system is set up to support that work, paying teachers for the time they spend collaborating. Despite the barriers, McDougal is working to spread this idea to more schools and teachers. The Lesson Study Alliance holds public research lessons on the weekends when teachers from the area can come and observe the process. And, while he knows one exposure isn’t enough to give teachers and administrators all the skills they need to implement lesson study well, he hopes it opens their eyes to a new way of collaborating that could actually change math instruction to focus on problem-solving, a goal the US has claimed is a priority since the 1980s.